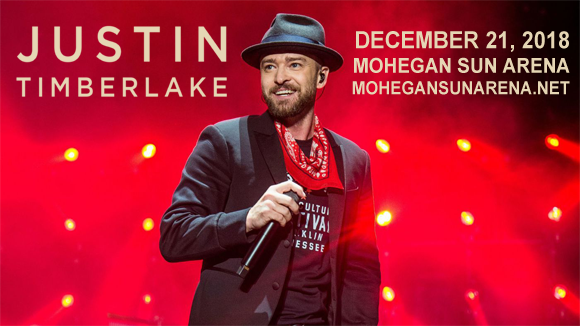 World-renowned pop and R&B superstar Justin Timberlake comes to Mohegan Sun Arena on Friday 21st December 2018! Timberlake is performing as part of his highly celebrated Man of the Woods Tour, where the "Cry Me a River" singer creates an intimate, round-the-campfire feel with his audience, as well as busting out the high-end production and insane song and dance numbers this ten-time Grammy Award-winner is known for! One of the world's best-selling music artists and twice-named by Time as one of the one hundred most influential people in the world (2007, 2013), Justin Timberlake is an American singer-songwriter, actor, dancer, and record producer. A child star, featured on the television shows Star Search and The All-New Mickey Mouse Club, Timberlake shot to fame in the 1990s as one of two lead singers of the vocal group NSYNC, which eventually became one of the best-selling boy bands of all time. In 2002, Timberlake embarked upon a solo career, releasing his R&B-flavored debut album Justified that year, launching the singles "Cry Me a River" and "Rock Your Body", and earning his first two Grammy Awards. To date, Timberlake has sold over 32 million albums and 56 million singles globally, with four number-one albums to his name. Throughout his career, he has won ten Grammy Awards, four Emmy Awards, three Brit Awards, and nine Billboard Music Awards.